In mall, entertainment has grown significantly as a pull factor. Ever wondered why these are seldom located at the ground level of a mall? Are they not crowd pullers? Ain’t these entertainment providers garnering enough revenues to pay the higher rentals to be better placed in a mall? Is business not faring well? Or is it the other way round? Entertainment in a mall caters to a noteworthy share for a mall’s mix. It has now become imperative to have an entertainment centre for a mall’s success. The space being leased out to them is growing day by day. 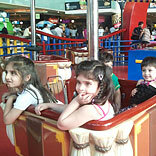 Be it a gaming centre for kinds, attraction for the young ones or a multiplex, it sure is in a demanding position today. Giving figures Bappaditya Basu, Senior Vice President - Retail Services, Jones Lang LaSalle India “If the mall is entertainment driven, regional mall, or a mall of more than 1.2 million sq feet, the entertainment is generally is about 20 to 30 per cent. But with the size smaller, in the heart of the city, where creating foot fall is not a problem, mall entertainment centres are less that 10 per cent of the leasable area.” At DLF Place, Saket, at least five per cent and at most 15 per cent space is reserved for entertainment. For Inorbit, this begins at three to five per cent and goes up to seven to nine per cent. Weekends usually draw more people as compared to weekdays as people have more leisure time to enjoy the entertainment portfolio. Basu reiterates, “Weekends are generally thrice the week days. Also summer holidays and public holidays are time when they are occupied the most. We found though our experience that both entertainment-oriented shoppers and cross-shoppers are seeking furn and enjoyment through their mall activities, whereas shoppers pursing particular goods and services are generally not drawn to entertainment activities. In addition to their retail preferences, today’s generation wants entertainment such as movie theatres, taverns and night’s clubs, a better selection of restaurants and a spa. They wants amusement rides and attractions like ice skating rinks, roller rinks or a swimming pool, possibly thinking of their children while they are shopping. Regardless of the shopping motivations, positive experiences translate into a higher probability of repeat business and that entertainment can be part of an effective strategy to increase visits and shopping centre profitability.” For DLF Place, Saket, on weekends the number of visitors increase by 10-15 per cent because of these areas while at Inorbit, offerings would pull around 7,000 people on weekdays and around 12,000 on weekends. Every mall owner has a different perception for their entertainment centres and this usually revolves round the mall’s location and the clientele it is catering to. Whatever be the reason they opt for entertainment activities, if not for revenues then for the footfalls, they cannot do without them.